I didn't intend to make this binder cover. 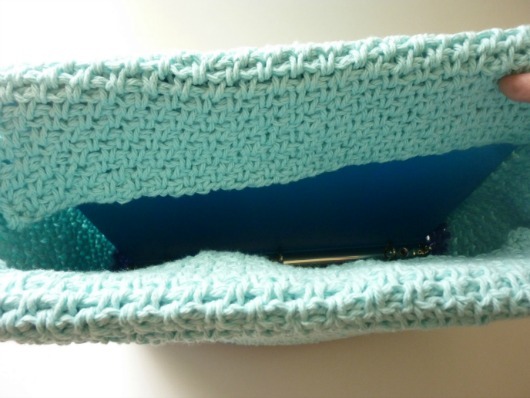 I really had wanted to make a purse. But sometimes my projects don't turn out the way I expect. Like the bag in the picture below, for example. I loved working with the moss stitch so much when I did my Dynamite Cowl that I wanted to do something else with it. 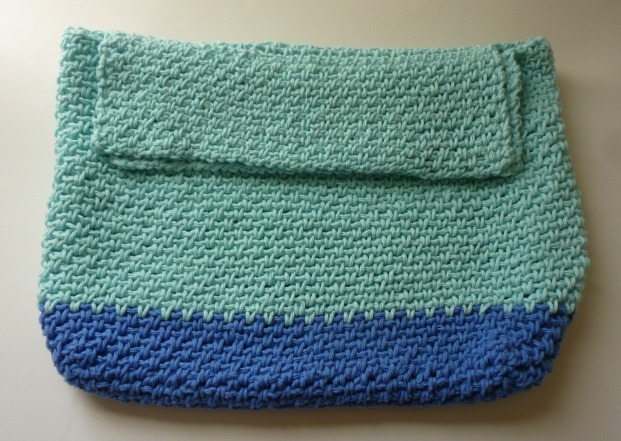 A cool slouchy bag with a zippered flap for the top. I spent days (DAYS!!) 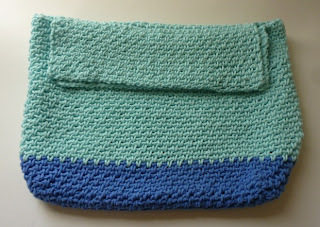 working on the bag, and when it was done it looked so cute laying out flat . And it looked so awful sitting up. It wasn't something I would carry. Even putting handles on it wasn't going to help. I had intended to line it, but honestly, that wasn't going to help the shape. I was so frustrated and disappointed in the whole project that I almost frogged the whole thing to get my yarn back, but I had put some seams into the bag that were going to make frogging an unpleasant challenge. Luckily, that was when we all started talking about doing some recycling projects and it made me think about my disappointing bag in a different light. Sure, it was not what I wanted to carry as a bag, but it would make a really fun cover for my calendar binder! 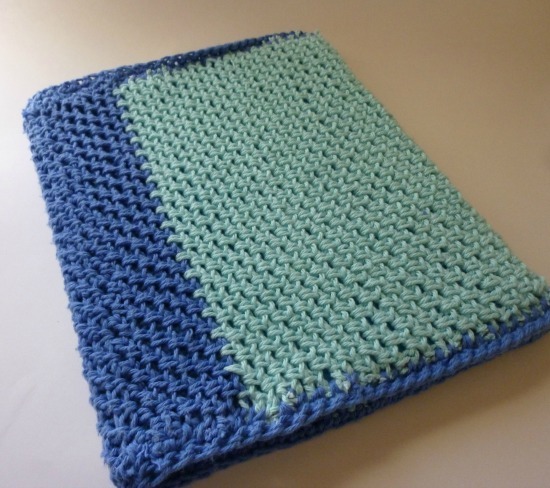 This isn't a tutorial on how to make a ridiculously labor intensive crochet bag. It's a technique to save something that still has beauty in it from being thrown away. I'm sure you've seen old crochet blankets in yard sales and thrift shops for prices so cheap that you couldn't walk away without it. This is the perfect project for them. You won't feel bad if you're cutting up an old blanket that's seen better days so that it can become the world's coolest binder cover, right?! This technique is a down and dirty version of steeking, a technique sometimes used in knitting to make fair isle cardigan sweaters. 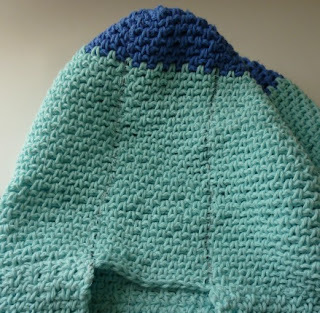 (The piece is knit in the round, and seamed up the front so that it can be cut apart. Then the cut edges are knit over, which become the sweaters button bands, so that no one can tell that it had been cut.) This version is a little less precise, but it's fast and the results are pretty cool! 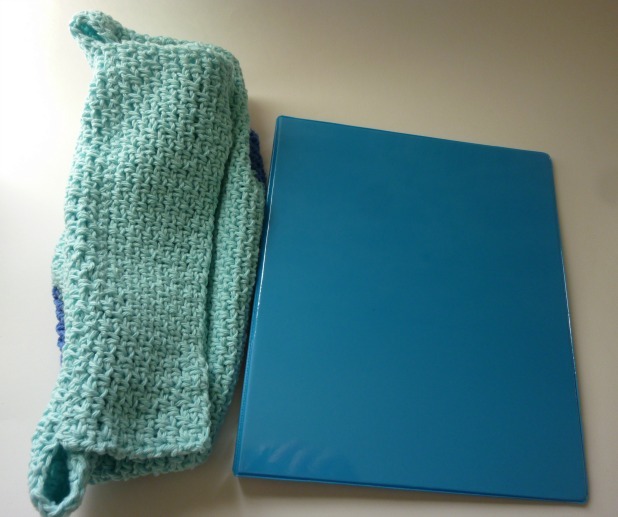 First off, make sure that the crocheted piece that you're using is large enough to completely cover your binder. With the binder inside the crocheted piece, use the marker to draw lines on the fabric where the ends of the binder are. Now comes the really scary part. 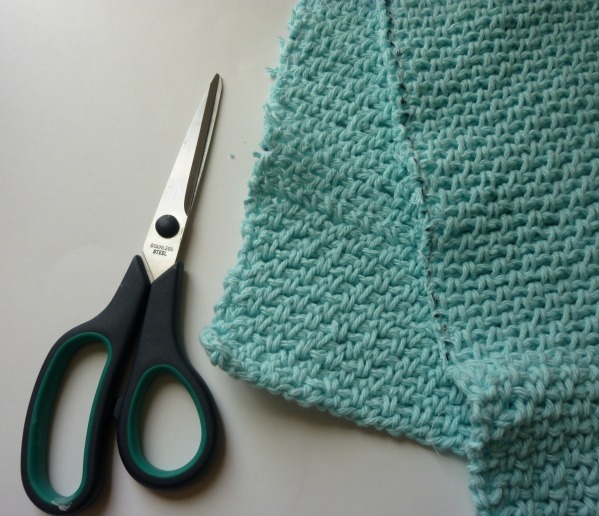 Being very careful not to cut the sewn seams, cut away the excess crochet fabric. 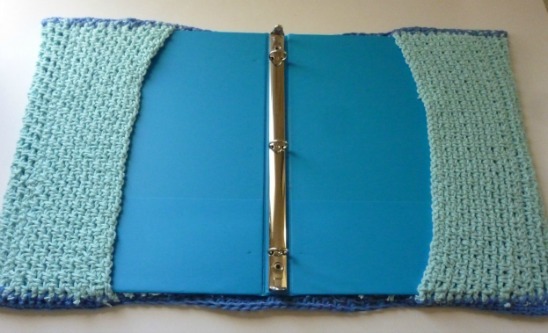 Now go grab your binder and cover it with the fabric again. The edges are a little rough, but it looks like it's a great fit! 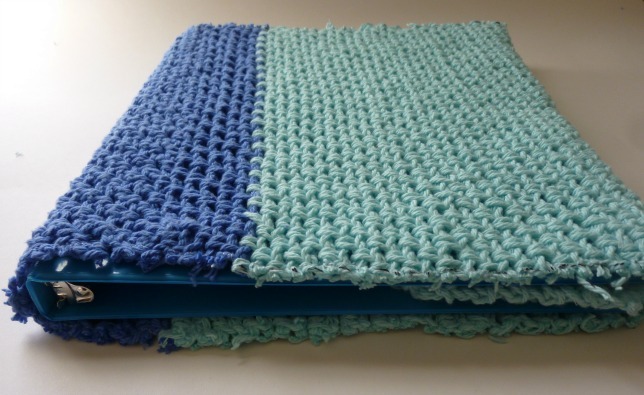 Using your yarn and crochet hook, crochet over the cut edges! I crocheted the piece around the binder (since I don't intend to ever take the binder out) by crocheting the inner flaps directly to the outer cover (like a peechee folder). 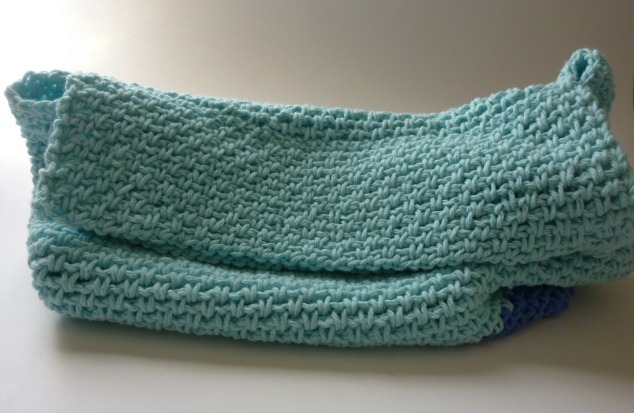 Because my piece was made in moss stitch I crocheted 1 single crochet stitch for every 2 rows as I went along the edge (adjust your stitches for the fabric that you're working with). 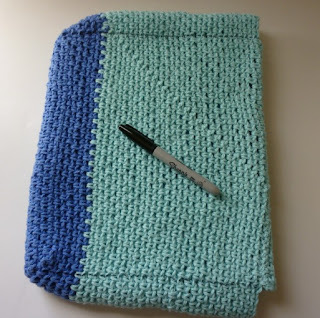 For extra reinforcement, when I finished the first row, I did a second row. Then I fastened off the ends and wove them in. I really like how it came out. It's something that I'll use a lot, even if it doesn't work as an organizational binder it'll still be a great place to keep patterns. I think there's a lot of potential in this technique. I want to experiment with using sewing patterns to make more complicated projects in the future. I love the idea of creating something unique and fun out of something that was otherwise going to be discarded. Recycling this way has so many possibilities! 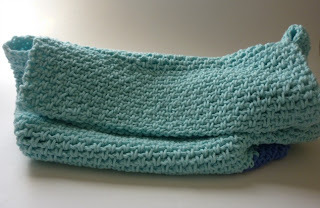 For more fun recycling with crochet projects, check in the January 2013 section of my Free Crochet Patterns page. Hi! Your calendar sounds really cute! I'm going to have to go check out the calendars at my local Staples! Thanks so much! Oh that is a cool idea.